Decidedly more rural in the years before the construction of Sacred Heart Church, the land that would eventually sit under the parish’s buildings was then owned by the Meadowcroft and Andrews families. Moore, Andrews, Whipple, Meadowcroft: If you spent a good span of your childhood years in Lowell, Massachusetts attending school or church at Sacred Heart, all of these names will be familiar to you. The streets closest to Sacred Heart carry those names, which date back to the decades before Sacred Heart’s founding when the area was much more rural, and formed the southern edge of the city. But, who were they? And how did Sacred Heart come to be built in South Lowell? On June 7, 1880, James Meadowcroft owned precisely 39 acres of land on the southern side of Moore Street. Some was tilled; some lay fallow. Meadows formed some of his land; the rest was forest. Meadowcroft was a wealthy man. He also owned the farming implements, machinery, and livestock to sustain a healthy income. He had year-round help in running the farm. And, his farm had produced hay, milk, butter, eggs, and potatoes during 1879. By no means a young man at 63 in 1880, James Meadowcroft was what that age called a gentleman farmer. He had retired from his profession as a blacksmith. His wife, Alice, 60, was just a bit younger. Both had been born in England. He had become a naturalized citizen in 1852. By 1880, all of their children had moved on; only a nephew, George Green, lived with them. He was 48 and without occupation. A servant named Sarah Moody saw to their needs. Some years before, James Meadowcroft had cut out a small portion of his land for his oldest son, John, who lived in a home on the western edge of his Moore Street property with his wife Bertha. John made his living as a real estate agent. His other three children had grown up and moved on. To steal a term from a much later age, the Meadowcrofts were ’empty-nesters’ and were probably looking to move on from the Moore Street property they had occupied for at least three decades. Across the street in the former home of William Andrews, a marble worker, the Litchfield family had just moved in. Paul Litchfield, 46, listed his occupation as a mill owner in 1880. He and his wife, Sarah, raised their family of five children on the future site of the Sacred Heart School, who ranged in age from 6 to 22 years old. Moore Street was still a dirt road in 1883 when church officials approached the Meadowcrofts about selling their land to the church. The street had at least been macadamized (paved with gravel) by 1891, when they approached the Litchfields about the sale of their land to allow for a parish school to be built. The area had remained very rural and quiet, but the Catholic population was growing in what was then the city’s southern extreme. By some accounts, the Catholic population in South Lowell had reached 3,000 by that time. A church was needed, and St. Peter’s was thought to be rather distant for those living in the Bleachery and Ayers City sections of Lowell. Some folks even came up from Wigginville, just down Lawrence Street – which, at that point, hadn’t yet been annexed from Tewksbury (and wouldn’t be until 1906). Until Sacred Heart Church performed its first mass in 1884, those 3,000 Catholics remained assigned to the St. Peter’s Church district. Ground was broken for the new parish on Eastern Sunday, 1884; church fairs were held to raise funds. Construction progressed rapidly. Father Joyce, an Oblate father and an assistant in the Immaculate Conception Parish, oversaw the founding of the parish, the buying of its land, and presided over the dedication of its basement, on August 10, 1884 by Archbishop Williams, after a solemn high mass was said by Rev. Father Lefevre of Montreal, the provincial of the order. While the basement was used for services, the church proper was constructed. Its corner-stone was laid in June 1896. 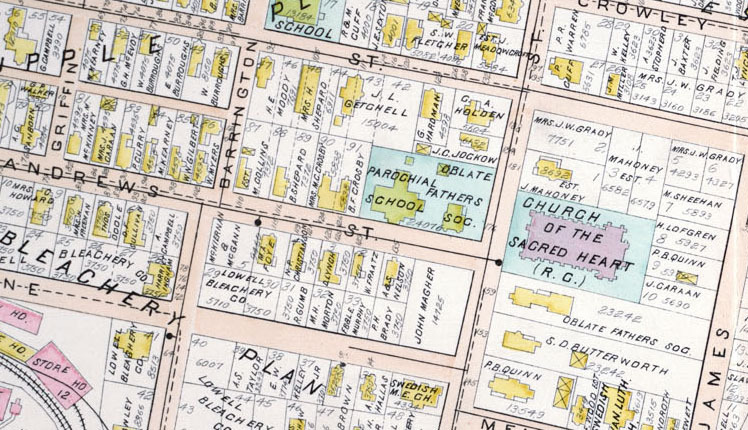 The Sacred Heart area, some 20 years later, in 1896. The area has experienced significant development, notably along the western side of Andrews Street and the south side of Moore Street. The first Sacred Heart School building was constructed to accommodate some 400 students – though, initially, the school had far less. It opened for the 1892-93 school year. By 1899, 250 students attended. Opposite the church, it fronted Andrews Street on one side, Moore Street on the other – though it was still separated by a single building, which was eventually razed and replaced in 1909 by what later became known as the “new old school” that burnt to the ground decades later, in 1967. As the school neared completion in 1892, plaster was applied to the woodwork in each of its eight classrooms, each 32 by 24 feet. Each classroom had its respective cloak room, measuring 4 feet by 18 feet. Lots of attention was paid to the woodwork, to the doors, and to the circular transoms above each. As the school was completed on its ‘garden lot’, a contemporary writer commented that the setting was ‘very quiet’, ‘surrounded by beautiful trees’ and had an open field in front of the building that was ready for construction to support the parish’s expansion. Readers – Do you remember the gleaming hardwoods, the transoms, and the cloakroom of the 1892 school building? Do you have other memories of the church, or any of the three Sacred Heart school buildings? During my time there, the 1892 school building was used for the primary grades, with the 1968 building housing Grades 4 and up. If you have any Sacred Heart photographs that you’d like to share, I will work them into a future post. My mother grew up in Sacred Heart Parish on 9 Prince Ave, named after the Prince Macaroni manufacturing building across the street. That building was previously a bleachery, and the street was previously known as Bleachery Street. How creative…! Hi Karen – I know that area well – and have been thinking about doing a post on Prince and Spaghettiville at some point. The Bleachery – there was a train stop out on Moore as far back as President Polk’s presidency when he delivered a short speech there in the 1840’s. With all the recent talk on Dickens’ visit to Lowell a few years earlier, it’s interesting to also recall some of Lowell’s other prominent visitors over the years. Interesting map – what is now known as “South Whipple” Street was known only as “Whipple”. How and when did that change get made? What was “Whipple”Street known as? I do believe that Oliver Whipple lived on the current Whipple Street, just a stone’s throw from his powder mill. 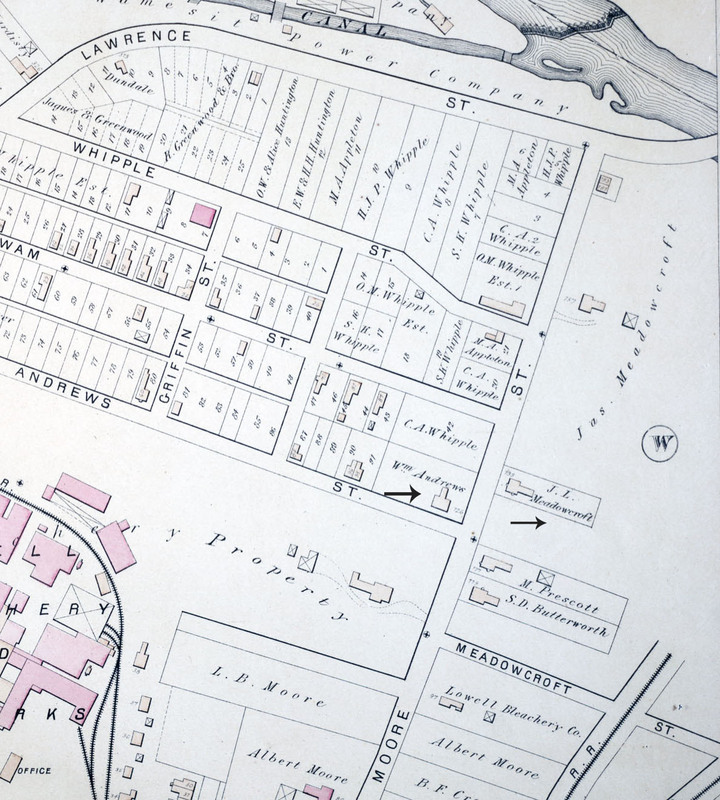 Hi Bill – Originally, I was going to say that the existence of two Whipple Streets in Lowell was a left-over from Lowell’s annexation of what is now South Lowell from the town of Tewksbury, which happened in a series of waves between 1834 and 1906. What I’ve seen in other annexed areas is the changing of street names several years after the annexation. But, the area that is now So. Whipple was annexed in 1834. I doubt much existed at all in that area back then. I noticed that Oliver Whipple also owned land on the corner of Moore and what is now So. Whipple. I think that this second Whipple Street, in today’s Sacred Heart neighborhood, was known both as Whipple and South Whipple, and, in the 1890 range, finally settled into its current name – “South Whipple” – to eliminate any future confusion as the neighborhood continued to be developed and its population grew. My second thought is that plans might have existed to connect the two Whipple streets for some time, but this never happened, and eventually this became impossible as properties were developed. Thanks for this article! My grandfather came out from Ireland in 1912 to his cousin Dennis Crowley who lived at 26 Andrews St. which must have been next door to the school. After seeing that the Church was closed, I was wondering about the history of the Sacred Heart Parish where my relatives must have belonged. Interesting article. Thanks. I remember the old building, especially the cloakroom, which I thought was cool. I attended from 1st – 3rd grades. Funny I don’t remember the other one burning down. Perhaps it burned down before I started school, which would have been 1967. Anyhow, now that I’ve read your article I wish I paid more attention to the architecture. Hi Judy – I hadn’t heard that story before. I couldn’t find much on the move of the old rectory, but did learn that the new rectory was built in 1922. My guess would be that the move of the former rectory to St. James Street must have happened in the earlier half of that year. Thank you that will help. I wish I had asked more questions. That was in 1980 and she was 85. She would point to each bedroom and say that was father so in so’s room. The front of 27 was the front of the house the kitchens being added. The front rooms and porches of 21 and 23 were added later. The dirt celler ended just before the parlors and the was no heat in them from what I can remember. When I was living there we had a tree stall garage to the right of the house and then a large lot with a chicken coup. We also had pigs. phasents. My grandfather had a tractor that we drove around. St. James St was a coasting street with posted signs that snow plowing was not allowed. We played over in the mountains (hill behind the house) in the coal bins where the coal trains used to dump the coal. I have many fond memories of living there. I remember it well. Went to school there and was married at SH in 1968. Was wondering if you know of a Father Smith that was assigned there in 1905 when my grandparents were married? Searching my family roots, I find a relative The Rev. Father Richard Mahoney who served at Sacred Heart Parish from the 1930’s into the 1960’s. Don’t know any more about him, but would love to. Hello, Thank you for this fantastic article. I grew up on the corner of Andrews and Moore St directly across from the school and church. I’m sure you know that the Sacred Heart Church and School closed some time ago. The school (the 1968 building) was demolished this past summer. A number of friends and I are organizing a Sacred Heart Reunion with the intention of raising funds for a Sacred Heart Scholarship at UMass Lowell. I’m writing to learn how I gain permission to use this article, photo, and maps to display at the reunion. I remember the Neary family of Sacred Heart. I’m an SHS graduate too, and was sad to see the building come down this past summer. I’d be honored if you’d feature my article at the reunion. You’re welcome to the map excerpts and the photo too. Do you have a reunion page? I’d be happy to post it to the blog, if you’d like. Thank you so much for your permission to use articles and photos from your website! The two articles regarding the Sacred Heart Parish are fantastic. I know they will be a highlight of our reunion. We do have a Facebook page. It’s entitled Sacred Heart Neighborhood Foundation or at least words to that effect. I’m at work right now and I can’t access it to send you the link. Thank you again for offering to post it four us. So in what years did you attend the Sacred Heart? Of course, I attended there but I also began my teaching career there. Write back, when you can. PS: If you’re not available for the reunion, we’re asking folks to make a fifteen second video stating your name, year of graduation and a short memory of the school. Send it to lsheridan@forsythe.com Feel free to join in! Hi Jim – thanks. I’ve found the FB page. I’ll add details for the reunion here and I can add to the historical society page too. I attended SHS from ’82 thru ’90. When did you graduate? By the way, there’s a FB page called Lowell Firefighting. He had, recently, some really good photos of the ’67 fire. You might want to check them out. Hi – Our paths have had to crossed somewhere along the line. I was a teacher at SH from 1979 – 1984. I taught the upper grades and as I recall the “old school” was still standing and its classrooms used for the younger grades. Thanks for all your help. And, if time allows, send us a quick video. When I attended SHS (1949-1957). Grades K-3 were located in the 1909 building and the upper grades were in the “old” building. I recall the top floor of the 1909 building housed an assembly hall where I first took to the stage in the school show, getting into a kindergarten squabble with a kid named Peter Heineman over whose turn it was to step out to recite our line. It was quickly squashed by a nun although chuckles came from the audience. I also recall the great loss when that building burned in 1967. A firefighter suffered a fatal heart attack at the scene. Many good memories, including the school store, the milk bottle distribution each day, May processions around the neighborhood, Boy Scouts, Camp Confusion in Tewksbury (Fr. Randall’s project), the Sacred Heart Band (I played bass drum), ham radio club (Fr.Walsh’s project), spaghetti dinners, movies in the “Guild Hall,” located in the basement of the older building. The Sullivan family was among those who were involved in the earliest days of that parish. My uncle, Edward, used to tell me of his adventures with the OMI Cadets, based there decades before I passed through those halls.It was more than buildings; it was a wonderful part of many lives in Lowell.